I cannot believe that it is Friday already! Where did the week go??? Oh yeah…it probably went to the brilliantly “simple” home improvement ideas I had on Tuesday. If my husband knew what was good for him (and our bank account) he would post a picture of me by every cashier at Home Depot with a note saying DO NOT LET THIS WOMAN BUY ANY HOME IMPROVEMENT ITEMS. LOL!!! I think every time I step into a home improvement store I suddenly snap into this overly optimistic mood, and have delusions of my actual home improvement ideas. Or, just to move some of the blame off myself, maybe I should sue all companies that put instructions on the back of their projects making it sound “so simple” or “no fail.” I think that my crafting spirit somehow believes that it can magically transform into “Super Handywoman,” because everytime I get to the store I am 100% confident that I can fix this or that all by myself, yet somehow it never quite works out the way I envisioned. The biggest disaster was caulking the bathtub. I tackled this first as it should have been a 30 minute job max. We have been having problems with re-caulking the tub. For whatever reason no caulk wants to stick, and it just peels off as soon as it gets wet (and yes we have been following the directions.) Caulking the tub was supposed to be a surprise to Mike when he got home from work. After all its not rocket science. I asked the Home Depot guy what to do about the issue, and he showed me some caulk remover (as maybe the new caulk wasn’t sticking because there was too much old stuff left behind) and he picked out a caulk for me. Our house gave me yet another surprise….When I decided I would make sure I got all the old caulk out I found yet another SNEAKY surprise left by the previous owner. The caulk was up to 2 inches thick, and once I got to the end of that I could stick the plastic knife I was using 3-4 inches in before it was stopped by anything. There was nothing behind the lowest level of tiles???? I was starting to get scared that the whole wall would collapse if I pulled out all the caulk…not to mention how much caulk was actually falling down inside the gaping hole between the tub the wall and the tile. Why can’t Holmes on Homes come to Wisconsin? Our house would be a real treat!! So once I got all the caulk out I was left with the mystery of what to do about the hole. In the end I realized it doesn’t make sense to over do this as we are going to have Bathfitters come in next year (hopefully) to install a tub and surround around our current tub….as much as I love the idea of real tile we have to go with what we can afford 😦 So I start pushing caulk back in the opening, and run out of caulk before finishing (since I wasn’t expecting the big hole), and now Home Depot is closed. I was so upset, that after working on my 30 min project for over 5 hours I was basically going to have to start over the next day after I got more caulk because, the way I understand it, to get a proper seal I don’t think you can let half of it dry and then finish the rest??? This was just WAY more difficult than it was supposed to be!! As for the adventures with the rest of the home improvements I will add them to later posts. On to something that did work out as planned…. This is the card I made for a wedding Mike and I attended last Saturday. 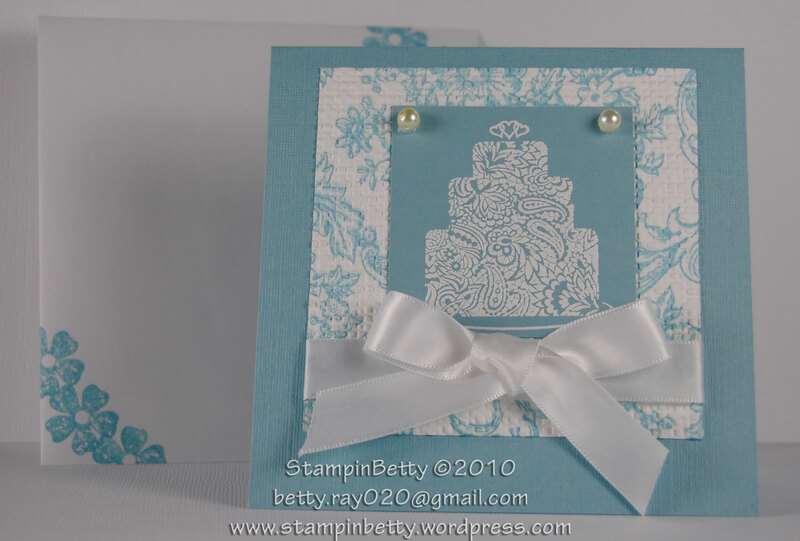 The colors used on this card are inspired by the colors used on their invitation. So it has been a few days since my last post….It has been pretty busy around here. Went to a wedding on Saturday, went to Polish Fest on Sunday (yep, my husband is half Polish and half Italian), and survived some more crazy weather yesterday. Suffice it to say I was not going to be in the third level of our house while we were under a Tornado WARNING 🙂 Luckily, living so close to Lake Michigan (just a few blocks away), once all the crazy stuff hit the cooler air of the Lake everything simmered down, and passed over us. Unfortunately, we can not say the same for areas just West of us that were hit by the same storm. I have NEVER been good about being alone in serious weather. Some people think its a thrill, but not me, I am the first one into the basement every time. My husband laughs at me, but if he thinks I am bad now he should have seen me as a little kid where I would actually be crying out of fear that a tornado was going to get me. I used to even have reoccurring nightmares about running from tornadoes and having nowhere to go. At least now I am fine with thunder and lightening, and even wind, but I still don’t do well when they start reporting serious wind damage, or there are reports of tornadoes anywhere near or heading in our direction. I have found a system that helps me NOT panic, and keeps me calm enough to handle the storms without giving it away to others that I am actually terrified. I have an actual action plan of what to do. I think the reason why it works so great is that it keeps me busy organizing, and doesn’t leave time for panic. It is all planned out, I know exactly what to do. The best part is that EVERY time I have put my action plan into action (because of actual tornado warnings or sirens) the storms always deteriorate or quickly pass without any of the forecasted dangers. 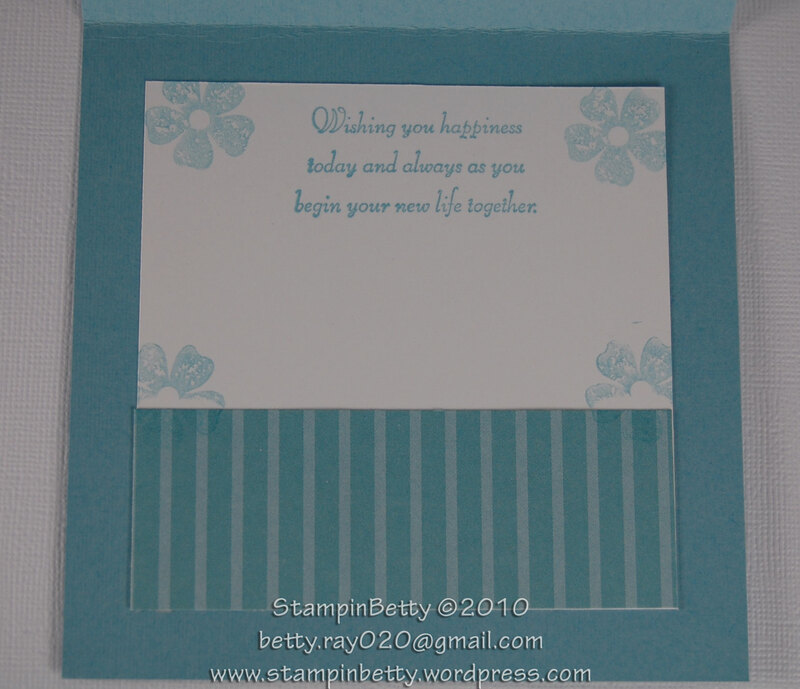 The project I am posting today is the card that I made for the wedding we attended this past Saturday. I chose the colors to match the colors they used on their invitations. 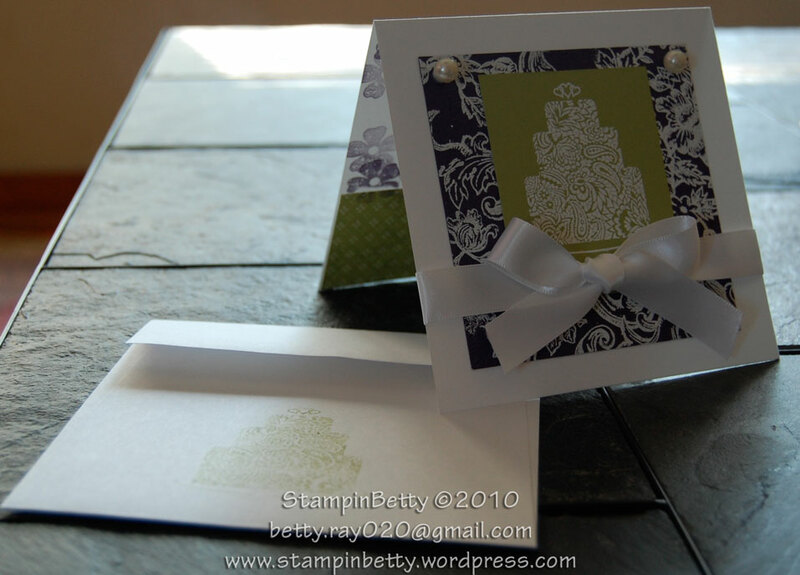 On this card I did a few “extra” things that I do not do often; I simply decorated a coordinating envelope, as well as putting a little extra effort into decorating the inside of the card. That is all for now. 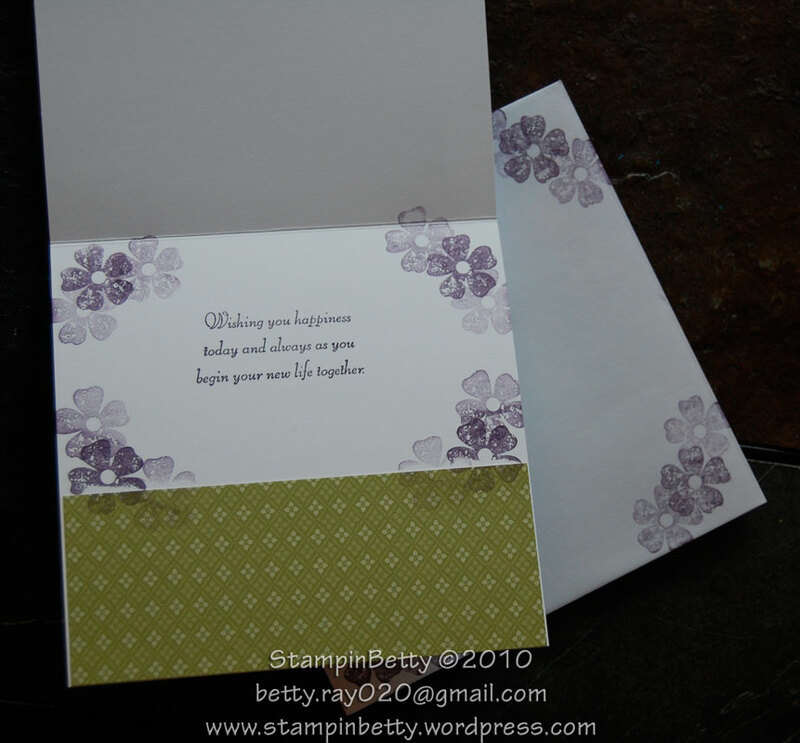 Check back soon, as I have been working on a huge organization project for organizing your paper and stamps!! It is taking a long time to complete this, but it will all be worth it when completed!! If you like what you see and want to help me complete this challenge donations of ANY size are greatly appreciated! !